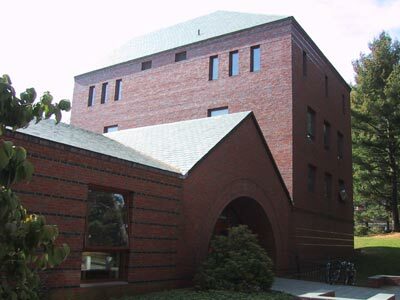 The Seeley G. Mudd Math and Computer Science Building, or "Smudd," as it's commonly known, is home to the Amherst Computer Center, as well as a number of classrooms, offices, and the Math Library. Work began in 1982 on the building, which was designed by Edward Larrabee Barnes Associates. The college received a one million dollar grant, one of 38 such grants totaling $50 million stipulated in the will of Seeley G. Mudd. The building was finished in 1984 and dedicated November 9 of that year (Archives and Special Collections, Buildings and Grounds Collection, box 14, folder 35). 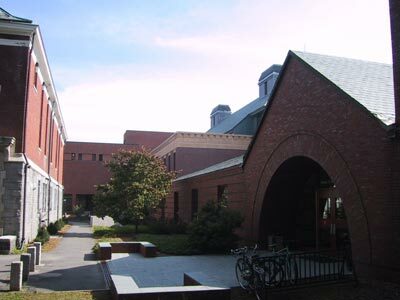 Smudd is at right, followed by the Life Sciences Building, Merrill, and the Pratt Museum, from right to left. (Photos taken 12 October 2001).